Just when I was saying there aren’t many sweater looks on this blog, here goes another one…and in a row, no less! 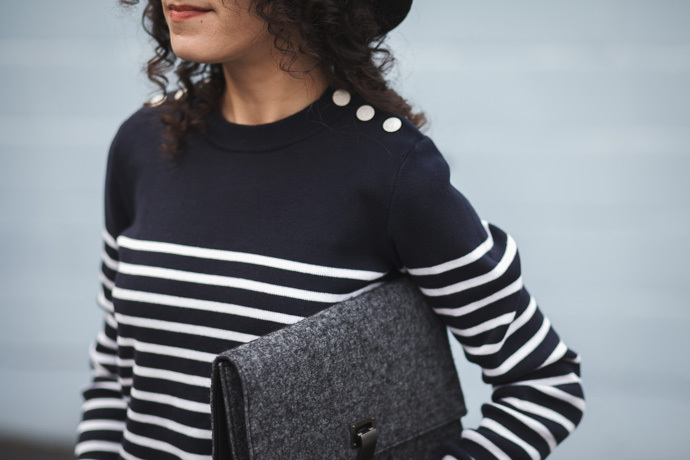 I wanted to get this Petit Bateau sweater up on the blog because it just made it to The Outnet in lots of sizes (including the one I’m wearing here, xxs) and at a nice discount. It’s a classic navy stripe in a mid-weight 100% cotton (it’s a heavier weight than I expected though, I was surprised when it arrived! ), with the cutest bright white contrast buttons at the shoulder. I also love how the stripe begins a little way down the chest, which I think looks really chic and is easier to pair with necklaces. My favorite color-way by far is the navy with white stripes, but it also comes in a white with black stripes (and black contrast shoulder buttons) which I also have. The navy gets far more wear! I’ve owned it for a little over a year and find it washes well (inside out to protect the buttons in a mesh wash bag, and then laid flat to dry), with no pilling and only a little fading of the navy color (as cotton does, unfortunately). If you’re looking for a nice, sturdy stripe sweater in a natural fabric to add to your wardrobe, this might be a good option for you. And if you’re a fan of Petit Bateau in general, there are quite a few items on discount including the classic mariniere stripe! 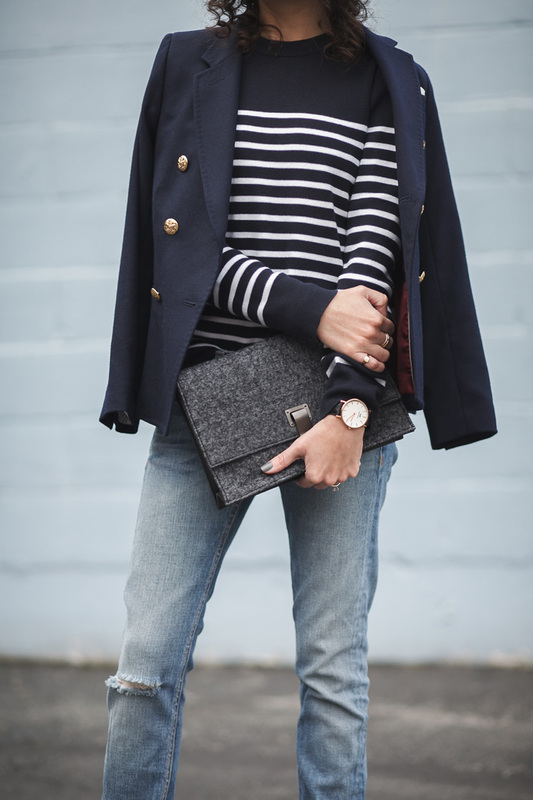 This nautical theme look is so charming and especially love the button details on the sweater! Loving the navy on navy combo. I agree with you that there’s something about the navy and white that looks better than the black and white. That jacket is fab too! A lovely classic…and the quality looks really good. The navy works so well with your jeans.